US PRESIDENT Donald Trump has said he intends to visit Ireland this year. Mr Trump is meeting Taoiseach Leo Varadkar in the Oval Office this afternoon where Brexit is high on the agenda for talks. 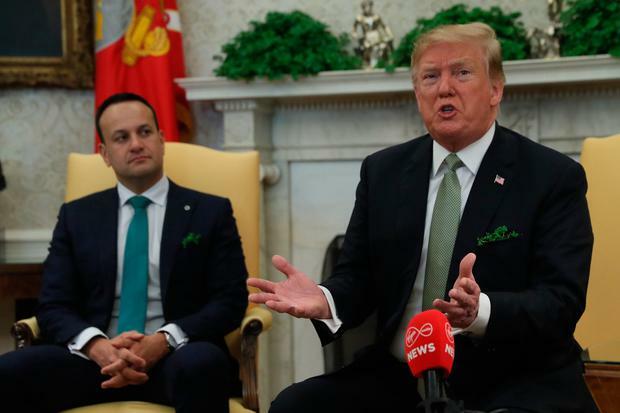 Mr Trump and Mr Varadkar disagreed on Brexit and the US President used the opportunity to criticise how the EU has conducted trade talks with the US. The US president said he was disappointed not to visit Ireland in 2018 and that he hopes to do so this year. He said that he and Mr Varadkar are becoming “fast friends” and he acknowledged the Taoiseach is in a “complicated position” due to Brexit. He said he has a “very warm spot” for Doonbeg, where he owns a golf resort. !It’s just a great place,” Mr Trump added. Speaking to reporters in the Oval Office, the US President said the US will stay out of Britain’s negotiations over Brexit. But he criticised British Prime Minister Theresa May’s handling of the talks. Welcoming Mr Varadkar, Mr Trump told reporters: “As you know he’s in a very complicated position because of Brexit. “You’re going to have to tell me what’s happening,” he said to the Taoiseach. Mr Trump said he wants Brexit talks to work out but was surprised at how badly the negotiations have gone, adding that Mrs May did not listen to his suggestions on how to negotiate. Mr Trump also said he did not think another vote on Brexit would be possible because it would be unfair, and reiterated that he would like to see a US trade deal with the UK after it leaves the EU. Mr Trump was asked if he’s still a Brexit supporter. “I’m surprised how badly it’s all gone from the standpoint of negotiations. “I gave the prime minister [Theresa May] my ideas on how to negotiate… she didn’t listen to that and that’s fine. “She’s got to do what she’s got to do but I think it could have been negotiated in a different manner. “I hate to see everything being ripped apart right now. Mr Varadkar said he looked forward to discussing Brexit with Mr Trump and that he would like to see a European trade deal with the United States. The Taoiseach said: “Well we have a different opinion. “I regret that Brexit’s happening and the UK was a really important part of the European Union but they’re going now and that’s their decision. “The most important thing for us in Ireland is that their decision to leave shouldn’t cause any problems in Northern Ireland where people actually voted to stay. “And that we shouldn’t have a hard border or anything to disrupt the peace process. “Also we want to make sure that we still have frictionless trade between Britain and Ireland. Mr Trump responded to this, complaining how the US was treated in trade talks with the EU and warned of tariffs being slapped on EU products. He said: “We’re talking about trade with the European Union. It’s been very, very tough over the years. “If they don’t talk to us we going to do something pretty severe economically.